Leprosy is a disease which is still endemic in most developing countries and also continues to be a significant cause of blindness in many communities. The number of new leprosy patients is slowly decreasing. Over the past twenty years, more than 14 million patients have been ‘released from treatment’ for leprosy but it is estimated that between one and two million people currently have severe disabilities, including blindness, due to past and present leprosy. As the number of leprosy patients decreases, it becomes more difficult to ensure health workers have sufficient knowledge about this disease. 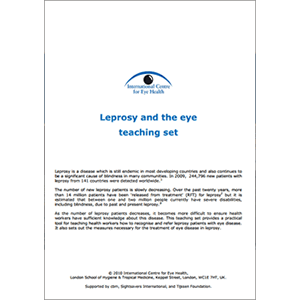 This teaching set provides a practical tool for teaching health workers how to recognise and refer leprosy patients with eye disease. It also sets out the measures necessary for the treatment of eye disease in leprosy. There are 26 topics in this teaching set, each with a short text and accompanying photograph.